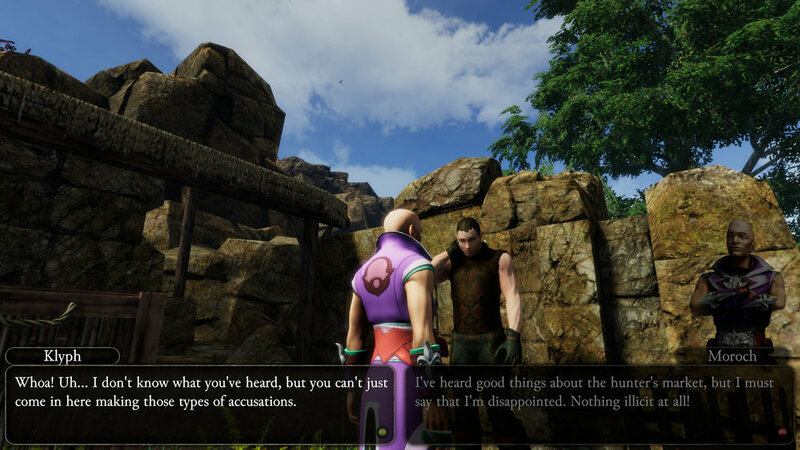 Wellspring: Altar of Roots seamlessly integrates classic RPG genres and elements into a cohesive and novel gameplay experience. 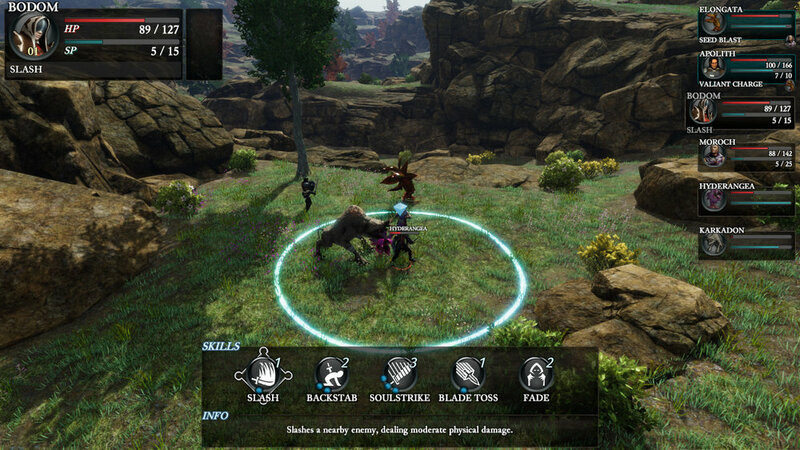 Featuring an engaging storyline, unique tactical combat, a progression system reminiscent of old-school JRPGs – and numerous Western influences as well – Wellspring: Altar of Roots offers massive environments and open-world exploration in a modern, 3D art style. Wellspring: Altar of Roots occurs primarily on the surface of the continent of Onich – a vast and isolated landmass surrounding a central ocean known as the Inner Sea. Discovered some 1,500 years ago by a number of refugees fleeing their own war-torn homeland, it quickly becomes clear that despite its welcoming appearance, Onich harbors dark and deadly secrets that were presumably left alone for good reason. In present-day Onich, the continent is slowly being ravaged by a force formally known as the Kelvari – an expansive, semi-sentient and root-like network of unknown origin and composition that has already “claimed” nearly 60% of the surface of Onich, primarily in the North and West. At the same time, unstoppable creatures known as “Rootsouls” accompany the slow but certain spread of the Kelvari. While massive regions of the continent are safe – either via proximity or outright delusional thinking – other nations are on the immediate boundary of the Kelvari fields and have at times had limited success in fighting back the scourge. Politically, this leads to much tension between disparate nations – many of which do not understand the existential threat posed, and as such do little in the way of offering up material support to those fighting. At the same time, a mysterious person known as Bodom appears along the Western shores of the Inner Sea – claiming to be from the Northernmost regions of Onich, despite it being all-too common knowledge that the North is utterly devoid of life and has been for centuries. Claiming the ability to destroy the Kelvari, Bodom quickly finds himself a valuable asset in the ensuing struggle against them – as well as the political machinations of regional and continental players. Enjoy a mature and highly-detailed plot spanning thousands of years – inspired by games like Xenogears and Shadow Hearts. 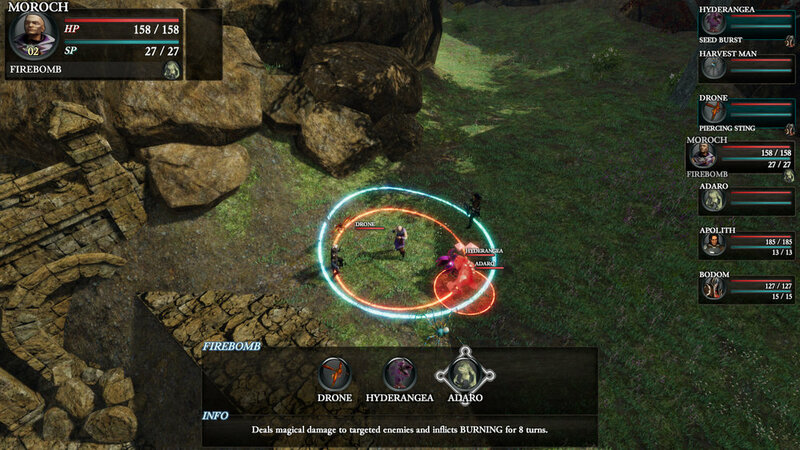 Fight in a challenging tactical, turn-based combat system where proper positioning and timing are critical. Visit a beautiful, massive world with modern 3D environments to discover, explore, and conquer. Fend off free-roaming enemies with a wide variety of movement patterns, behaviors and habitats. Prepare for an unrelenting and highly-intelligent enemy AI that can be scaled to various difficulty levels. Play alongside a large cast of interesting characters with defined roles, yet deeply customizable skill sets – allowing multiple builds for each combatant. Face enemies that learn and level up dynamically – accessing new skills, tactics, and other enhancements. Unlock, learn, and equip from hundreds of combat skills, attribute bonuses, and world-based buffs. Explore loads of side quests, optional bosses/areas, and minigames! Scavenge, create, and upgrade items using an original skill-based crafting system. Utilize an integrated bestiary system that rewards discovery, experimentation, and exploitation of enemies for rewards. Multithreaded Games currently consists of a small but dedicated core team of two Portsmouth, OH natives: Derek Bradley and Andy Fenton. Both are 2009 graduates of Shawnee State University, having received degrees from their nationally-renowned Simulation and Gaming Engineering Technology program. Wellspring: Altar of Rootshas been in active development since May 2015.